Born in Yao City, Osaka. Her stage name, Miyako Otsuki, was taken from “enka” record shops that used to be in Osaka at the time of her debut, named “Otsuki Gakki Ten” and “Miyako”. In 1964, debuted with the song “Haha Koi Shamisen”. 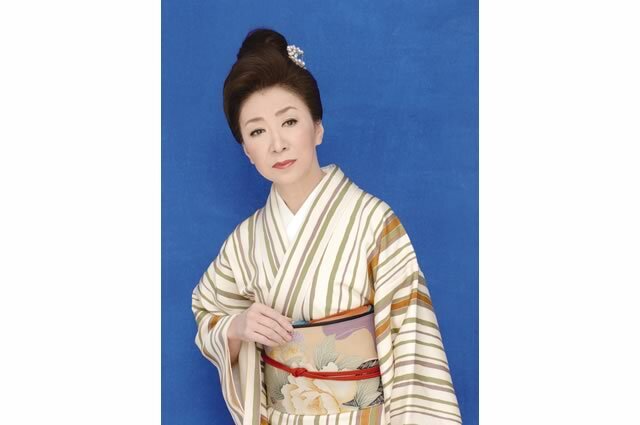 Made her first appearance at the “37th NHK Kouhaku Uta Gassen” in 1986 with the song “Onna no Minato”. From then on, appeared 10 times by the year 1996. In 1992, won the “Geijutsusai Sho” and the “34th Nippon Record Taisho” by the EP “Shiroi Kaikyo”..
She is known for her low-tone voice. On June 14th 2004, Held a party celebrating her 40th anniversary as a singer at Tokyo Prince Hotel. On June 20th of the same year, released a 40th anniversary special 12CD collection of her 198 singles up to her newest release, and was named “Ayumi” (aka “Otsuki Miyako Dai Zenshu”).